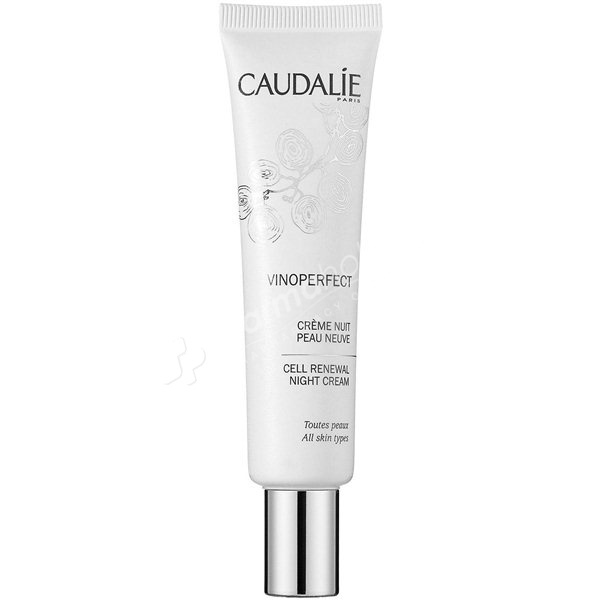 Caudalie Vinoperfect Cell Renewal Night Cream restores and revitalizes your skin while you sleep with active botanical extracts. Shea butter delivers omega fatty acids for improved elasticity and suppleness. Glycolic acid and papaya enzymes resurface and smooth skin's texture while reducing wrinkle depth and hyperpigmentation for a radiantly youthful complexion. This exfoliating cream works overnight to leave your complexion glowing and unified. In the morning, your skin breathes freely. It is detoxified, moisturized, smoother with a more even, incredibly luminous complexion. Patented Viniferine, a natural compound from vine sap, brightens, lightens and evens. Viniferine is 62 times more effective than Vitamin C3. Resurfaces, brightens and detoxifies skin. Diminishes dark spots and imperfections. Refines skin texture and reduces pore size. Paraben free, 0% Phenoxyethanol, 0% phthalates, 0% mineral oils, 0% sodium laureth, 0% animal ingredients. Apply in the evening on face and neck, either by itself or after your Vinoperfect Serum. Avoid the area around the eyes. Active Ingredients: Acide Glycolique, Papaye et Viniférine 500.